I will be constructing a circa 1869 visiting gown with a velvet jacket for outerwear. For the gown, I have some green and gold plaid silk. It’s pretty exciting, and I have lots of it. I plan on making an impressive skirt without an apron, scalloped at the hem line with some pleating showing below the scallops on the base skirt underneath. The bodice for the dress I am thinking will be high necked, simple, well cut and possibly belted. I may use the plaid for accent pieces on the bodice, but otherwise the bodice will be made on green silk. Fur trimmed coat. My intention is to keep it shorter in the front than this russet beauty. The coat will be velvet and will have a bustle/pouf portion with some side panels. I purchased a set of wild Canadian mink cuffs with a thick matching collar to attach to the jacket. I may trim the jacket with silk ribbon or fringe. The pièce de résistance will be the full plaid silk skirt, though I am thinking that the wild mink will be a show-stopper as well. Since two of the last three bustle gowns I made employed plaid, it would be safe to say I like plaid and bustles juxtaposed. 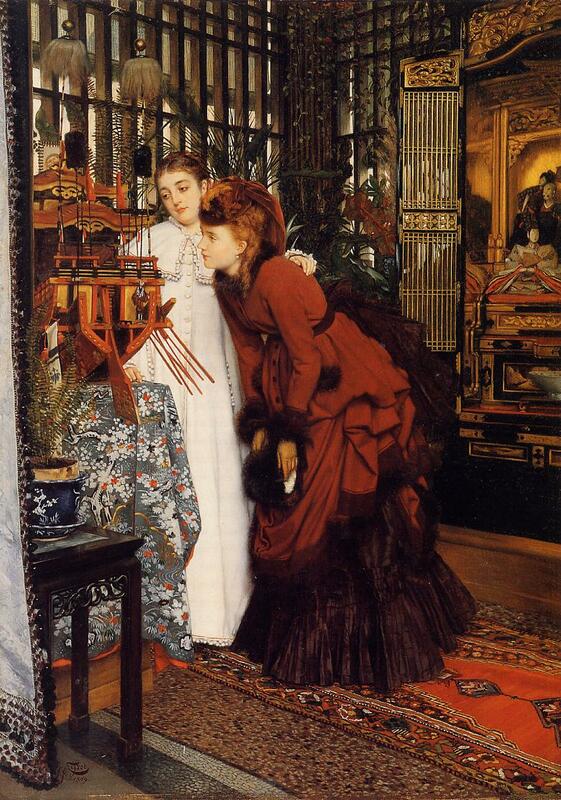 Tissot would empathize with the bustle and plaid fascination, and all of the competing pattern and lines therein. Plaid is such hardworking stuff that provides humor and surprise, though very easy to work with because of the whole grid design. Perhaps Tissot would agree. My goal for the next gown is to do a magnificent job with the tailoring. I was less enthusiastic about the tailoring of previous bustles. I am going to correct that this time around. I have some drawings and will be starting a mock up as soon as I dig out my bolt of muslin not in storage. Most of my patterns are indignantly stored away in a rubbermaid container in an unheated storage unit far away (poor patterns! ), so I’ll drafting from scratch. Fun, fun, fun!